My name is Darell and I study at De La Salle University in the Philippines. I joined ACOPIA because I wanted to gain experience on how NGO works and because I am interested in Korean culture. Activities I was mainly assigned to in ACOPIA were marketing, language teaching and web design. During the program, I developed my social and leadership skills. Most times interns work with minimal supervision so I really had to handle things on my own. I had the chance to witness a K-POP Camp during my internship stint. It was interesting to me because I saw how some Japanese and a Sri Lankan girl really wanted to be an idol. At such a young age, they are already reaching for their dreams and I was really impressed by their talent. me so much and was patient and understanding when I encountered I was faced with difficulties at some point. I only work Monday to Wednesday so having a long weekend lets me explore Seoul. I was able to go to various places and even though I was winter time, it was really beautiful seeing Seoul. During my three month stay, I became close friends with people from France, Finland, Brazil and Japan. 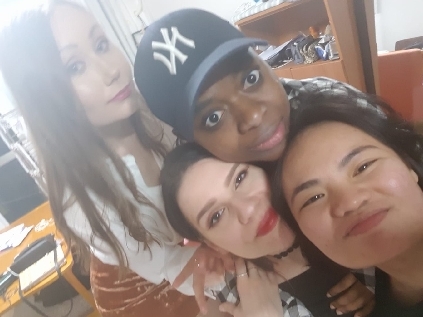 It was interesting living with these girls since we all came from different countries. We have differences but at the same time we also had a lot of similarities. We got along pretty quickly and my stay in ACOPIA would have been so different if it wasn’t for them. Overall, the experience was memorable and I really had an exciting time.